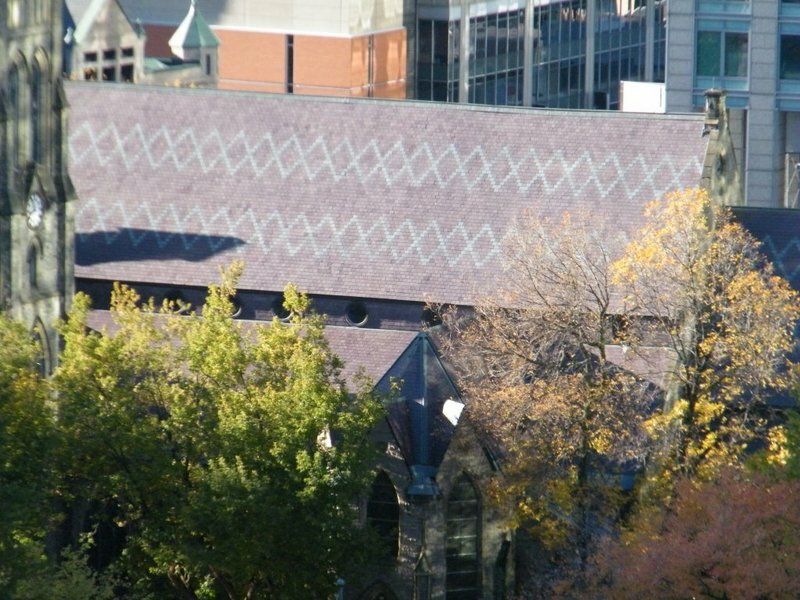 A slate roof truly can be as unique as you want it! You may decide on a random width single color, multi-color, graduated, scallop shape, floral pattern, diamond point, hang-down or even incorporate the date the building was made! Each slate roof really is one of a kind. North Country Slate offers 10 different colors in unfading and semi-weathering, along with 30 different sizes ranging from 12” long to 24” long. Once a pattern has been selected, the architect will create a template for the quarry or distributor. Each piece is then hand cut to spec. If using multiple colors, the architect and owner will specify the percentage of each color. Graduated roofs which are different lengths, widths and thicknesses, can be traced back to the days when quarries sold pallets as is. Now days, colors are separated and most pallets are individual sizes. A building owner will work closely with their architect on the design options. Care is taken when making the final decision as an S1 rated roofing slate and proper installation, a slate roof will last 100 plus years! For design and technical advice, please call one of our Sales Representatives at Toll Free 1-800-975-2835.